Collaboration with celebrated conductors such as Sir Neville Marriner, Vladimir Fedoseyev, Daniele Gatti, Lawrence Foster, Jiri Belohlàvek, Michail Jurowski, David Stern, Christoph Poppen, Vladimir Spivakov, Mikko Frank and Louis Langrée as well as with major orchestras such as the Staatskapelle Berlin, Leipzig Gewandhaus, Orchestre de Paris, Orchestre National de Lyon, Orchestre National de France, Radio Orchestra of Hessischer Rundfunk, Radio Symphony Orchestra of Baden-Baden, Munich Philharmonic Orchestra and Bamberg Symphony Orchestra has brought him to the most famous concert halls and festivals worldwide – Tonhalle Zürich, Berliner Philharmonie, Concertgebouw Amsterdam, Palais des Beaux Arts Brüssel, Théâtre du Châtelet, Théâtre des Champs Elysées, De Doelen, NCPA in Beijing, Suntory Hall in Tokyo, Auditorio Nacional de Musica in Madrid, Verbier Festival, Schleswig-Holstein Festival and Menuhin Festival Gstaad. Kirill Troussov is a passionate and committed chamber musician who performs frequently with artists like Sol Gabetta, Yuja Wang, Julian Rachlin, Daniel Hope, Joshua Bell, Gautier und Renaud Capucon, Natalia Gutman, Christian Zacharias, Yuri Bashmet, Mischa Maisky and Elisabeth Leonskaja. Highlights of his past concert seasons include – substitution for Gidon Kremer in Paris, Asia Tour with the Verbier Festival Chamber Orchestra, his spectacular performance at the BBC Proms and his activity as jury member at international competitions, a.o. at the “Schoenfeld International String Competition” in China. He has been awarded the European cultural award “Pro-Europa”, the Yamaha Prize, the Davidoff-Prize of the Schleswig-Holstein Musik Festival and numerous prizes at international competitions. 2018 amd 2019 Kirill Troussov gives master classes at the Mozarteum Salzburg, European Music Intstitute Vienna, in Hong Kong, St. Blasien, Berlin, Cremona, Madrid and Olso. Kirill Troussov’s recordings – among others for EMI Classics – were given many awards by the international press. He performs with Yuja Wang on her DVD with Kurt Masur 2011. Schwarz-Schilling`s Violin Concerto with the Staatskapelle Weimar was released 2013 and a recording of chamber music works by Mendelssohn 2014. His recent CDs “Emotions” (MDG) and “Memories” (MDG) have been highly praised by the international press and the public – among others by “Süddeutsche Zeitung” and the french trade magazine „Diapason“. 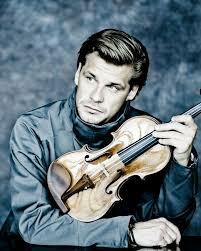 He completed his studies with Zakhar Bron and Christoph Poppen. His mentors have been Igor Oistrach, Herman Krebbers und Sir Yehudi Menuhin. Kirill Troussov plays the Antonio Stradivari violin “Brodsky” of 1702, on which violinist Adolph Brodsky performed the world premier of Tchaikovsky’s violin concerto on Dec 4, 1881.